Though shrouded by the mists of time, the early records of Scotland reveal that the name Gray is of Norman origin, introduced to the region after the Norman conquest of England in the 11th century. Our historians consulted such ancient manuscripts as the Domesday Book (compiled in 1086 by William the Conqueror), tax records, baptismals, family genealogies, and local parish and church records in search of early records of the name. Gray was first found in Northumberland, with Anschatel Groy of Haute Saone, Normandy, who fought with William the Conqueror in 1066 AD. After the conquest, Anschatel Groy settled in Chillingham, Northumberland. He was from the department of Haute Saone called Gray, sometimes Groy, or Croy, in Normandy. From this house sprang the Grays of Suffolk, Kent, Tankerville, and Stamford. John de Gray (died 1214) was Bishop of Norwich in Norfolk, and later became Archbishop of Canterbury, but was never confirmed. The Normans were descended from the Vikings that raided Northern France in the late 9th and early 10th centuries. The French King, Charles the Simple, achieved peace in 911 by creating the Duchy of Normandy, named after the Norsemen, and granting it to Rollo, their chief, who ruled as a vassal of the French King. However, rather than transforming that portion of France into another Scandinavia the Viking settlers adopted the culture of the natives and merged with them. So though they had Viking roots, it was French speaking, Christian people that invaded England, and not Norsemen. From England the Normans spread north to Scotland. The Scottish King, Malcolm Canmore was established as a vassal of William's and Norman influence gradually worked its way into Scotland. In 1128, the Earl of Huntingdon, who later became King David I of Scotland, invited his noble Norman friends to the north to strengthen his royal court, granting them larger estates than they had in England. Having spent part of his youth at the English court, King David was particularly influenced by the Normans and adopted many of their institutions and ideas. The surname Gray emerged as a notable Scottish family name in Northumberland where they were recorded as a family of great antiquity seated with manor and estates in that shire. The first bearer of the name on record in Scotland is Hugo de Gray, who was listed as a witness in a charter in the year 1248. In that same year, the Chillingham branch moved north. Hugh Gray settled in Berwickshire and John Gray became the Mayor of Berwick in 1250. Henry Gray rendered homage to King Edward I of England on his brief conquest of Scotland in 1296. Sir Thomas Gray of Lanarkshire was an important historian of early border life. 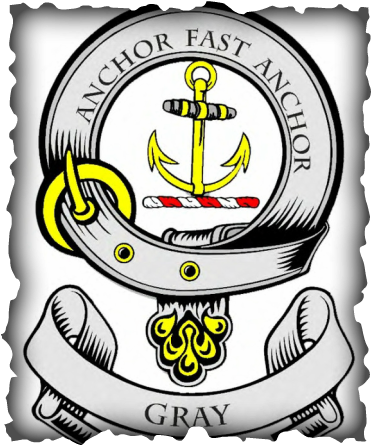 The Grays became more prominent in Scottish life and became a fully fledged Scottish Clan of great dignity. It was Sir Andrew Gray who scaled the rock of Edinburgh Castle to recapture it from the English in 1312, and he was rewarded with lands at Longforgan in Perthshire. In 1377, the lands of Fowlis also passed to the Gray family through marriage to a daughter of the powerful de Maule family, and in 1444, Sir Andrew's descendant, also Sir Andrew, and a loyal supporter of James I and II, was created 1st Lord Gray. Thereafter the Grays remained close to the ruling House of Stewart. Patrick, son of the 2nd Lord Gray, was a Gentleman of the Bedchamber to James II. The 3rd Lord Gray was Lord Justice General of Scotland in 1506. Patrick, 5th Lord Gray, was taken prisoner at the Battle of Solway Moss in 1542 and ransomed for £500 sterling, a princely sum at the time. Patrick, 6th Lord Gray, was caught up in the intrigues surrounding the fall of Mary Queen of Scots and although tried for treason, was released and exiled. Andrew, 7th Lord Gray, followed the Marquis of Montrose. In 1639, he resigned his honours to obtain a new patent in favour of his daughter Ann who had married her kinsman William Gray, younger of Pittendrum. William was killed in a dual with the Earl of Southesk in 1660 and the title passed to the earls of Moray, but on the death of the 14th Earl of Moray passed to his niece who became Baroness Gray in her own right. David Gray (1838-61), born in Kirkintilloch, was a prominent Scottish poet. Notable among the family at this time was Andrew Gray, 1st Lord Gray (c.1390–1469), a Scottish nobleman, politician and diplomat; Sir Andrew Gray (d. 1445) of Fowlis, Perthshire; Sir John Grey KG (c.1387-1439), English nobleman and soldier; and Edmund Grey (1416-1490), English nobleman. Huntly Castle, Longforgan, Perthshire was built in 1452 for Lord Gray of Foulis. Broughty Castle, Dundee, Perthshire. Five storey tower built by Lord Gray of Foulis in 1490. Owned by Historic Scotland.